So my old mate Tyberius wanted to organise a game of something and so asked me if I would arrange something. With the original intention for there to be 3 players per side I went to work and came up with something that used every ECW figure that I had many of which were unpainted (and still are). 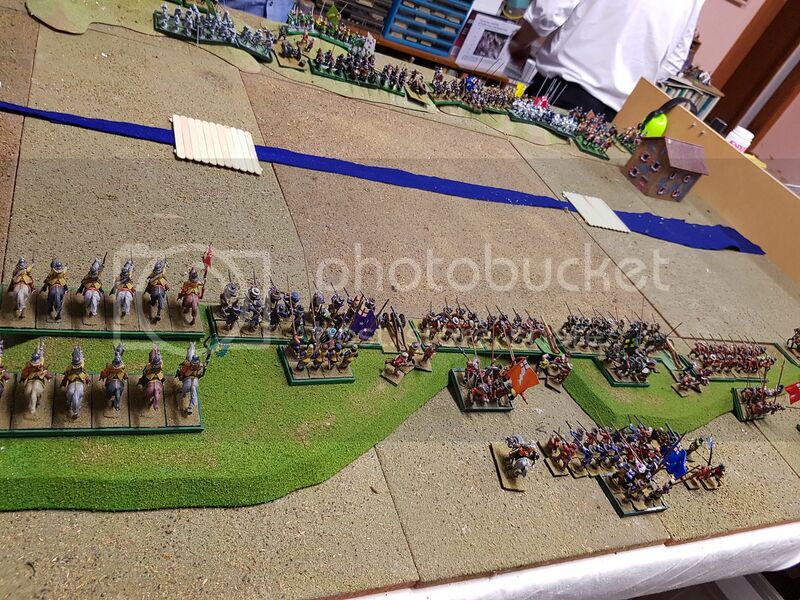 The rules used were "Charge Pike" by Wes Rogers. The Terrain was simple with parrallel ridgelines with a creek between them that could be forded any where but also had two bridges. The armies deployed along the ridges and faced off. For the Royalists, King Charles (Ty) commanded the centre with their artillery and 7 regiments of foot with Prince Rupert (Wes) to his left with 2 regiments of horse, 1 of lancers and 1 of dragoons. 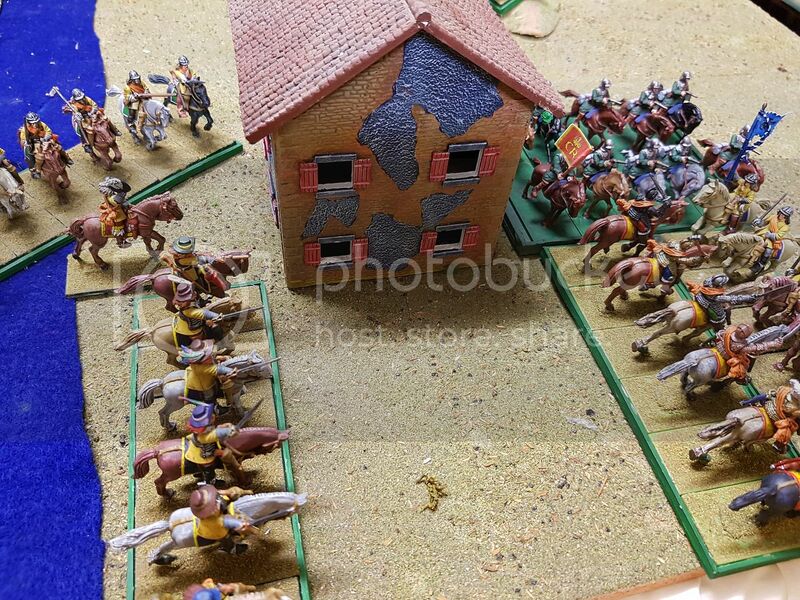 On the other flank Sir George Georing (Wes again) 4 regiments of horse tried to stay sober. 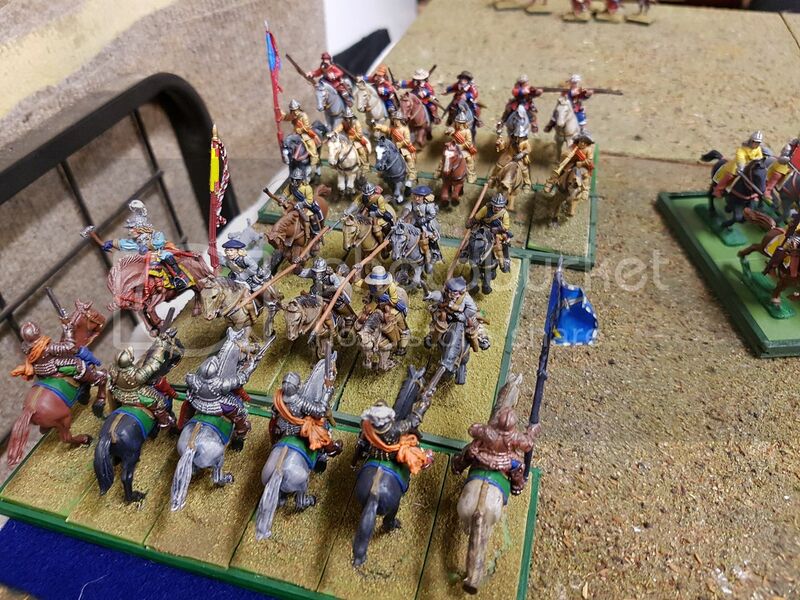 The forces of Parliment Mr Oliver Cromwell (Mick) had the right with 3 regiments of Horse, 1 of Cuirassier's and another of Dragoons, the Earl of Essex (Mick and myself) had the centre with artillery and 5 regiments of foot. 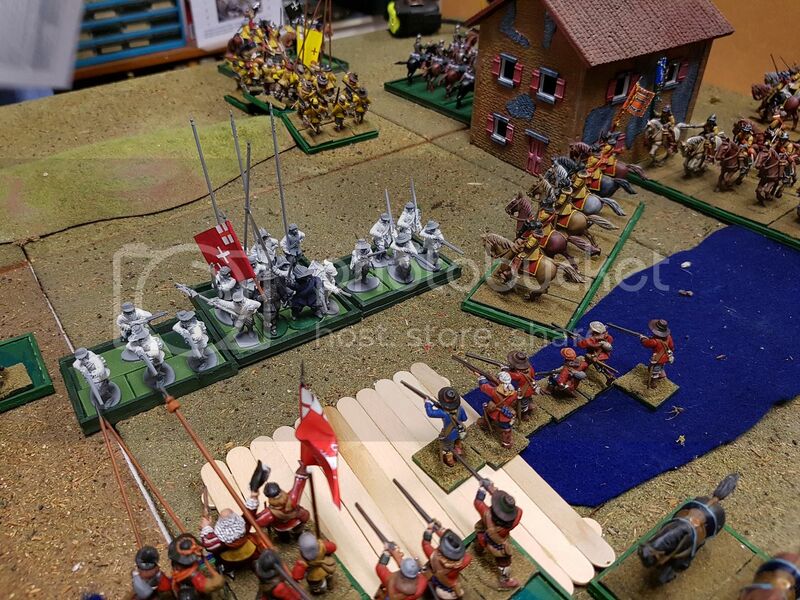 Sir Thomas Fairfax (myself) had the left with 3 regiments of horse and 1 of Cuirassier's. The line from the Parlimentary left. The battle began with an advance of Parliment up to the creek which Prince Rupert joined his lancers and charged Fairfax's Cuirassiers'. They drove the heavy horsement back but could not break them. However the cost was grevious, one lnacer and the Prince (oh and his dog, with a silver bullet). This at first did not seem like much but it would in time it would prove vital. 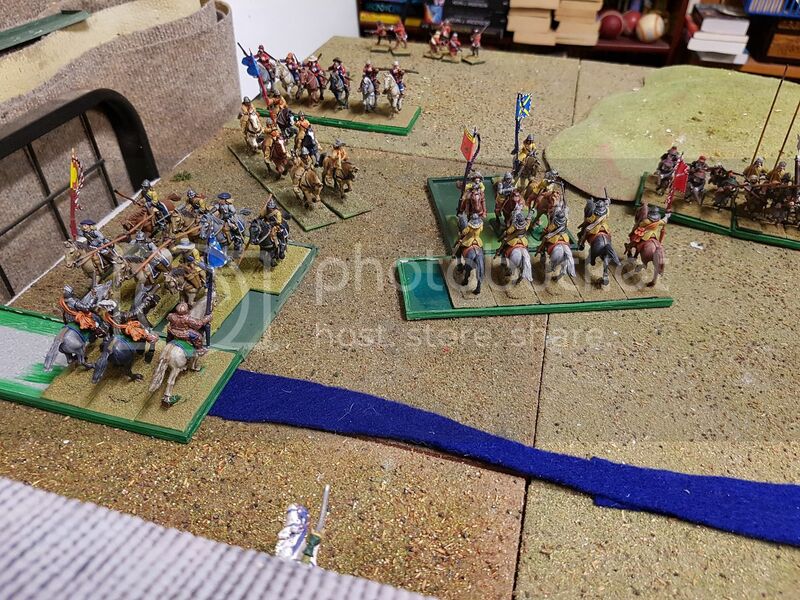 In the Centre, the Royal Irish advance on the bridge to the Royalist centre right, supported by the other regiments, including some county militia who proved to their commander that they have no idea of manuver and take 2 turns just to change the direction they are facing. Down of the Parlimentary right things go cautiously with musketeers and dragoons lining the creek and firing away whilst their cavalry crosses over. The right goes right ahead. Royalist artillery is able to score and early success by destroying a battery of Roundhead light guns, but then misses everything. The light guns of the righteous has smaller but less spectacular success. 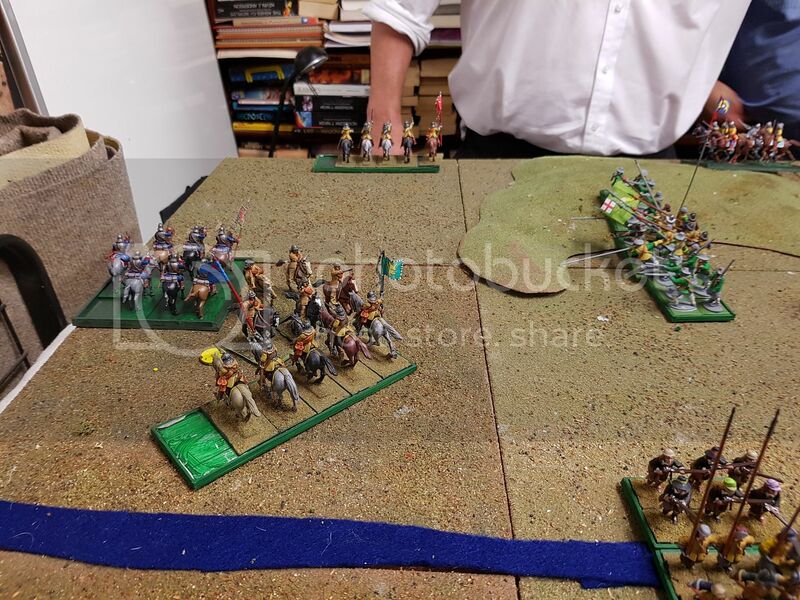 With his Cuirassiers just holding on, Fairfax crosses the creek and will drive back the Royalists, eventually routing 2 units as the dead Prince becomes a drag on Cavalier morale. 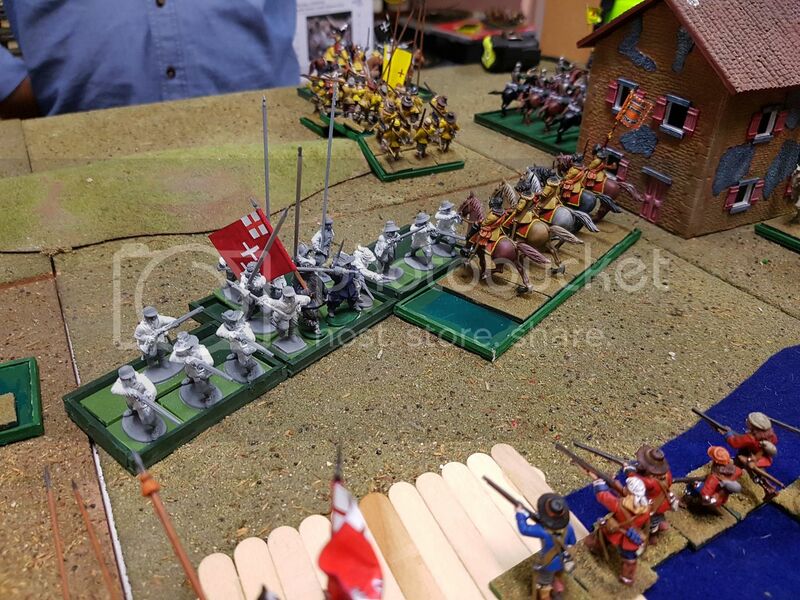 Cromwell does the same thing on the other side and has immediate success but his victorious troops are charged in the flank by fresh Royalist horse. 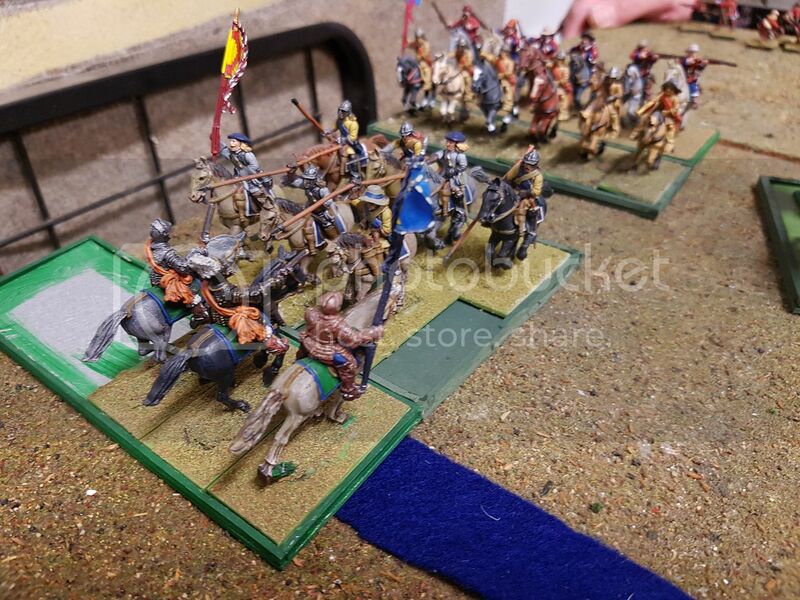 However thesae are raw Yeomanry and the Ironsides survive, turn and grind down their opponents. 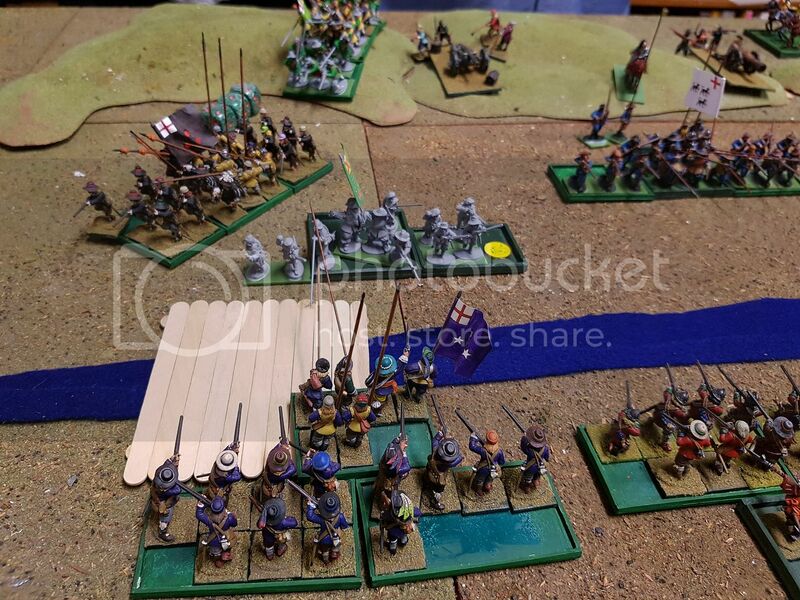 At one bridge, on one side of the Royalist infantry line, the Irish charge across. On the other end, Newcastle's foot also charges. Across the centre and large firefight ensues which Parliment is slowing winning have more shot to pike than the Royalists. 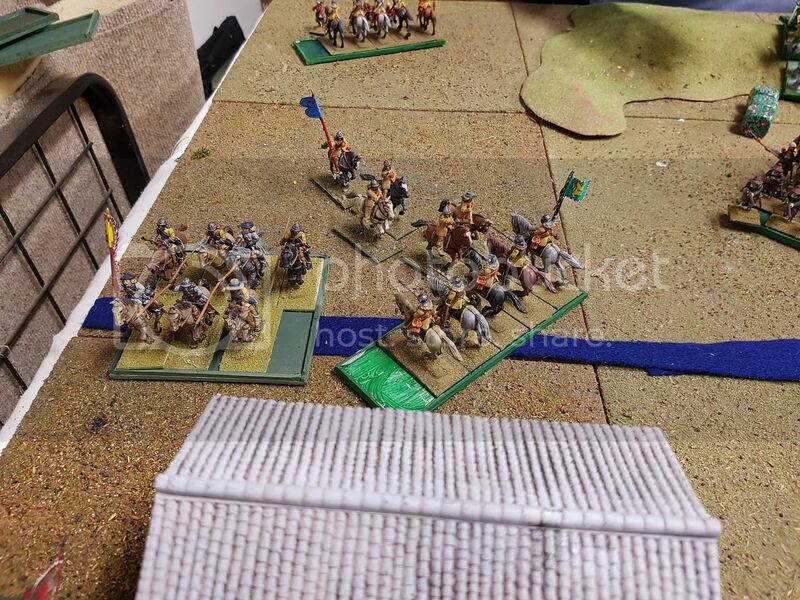 The Irish charges went through a hail of fire, from two regiments, and meets the New Model foot, only to lose the push of pike and be driven back. 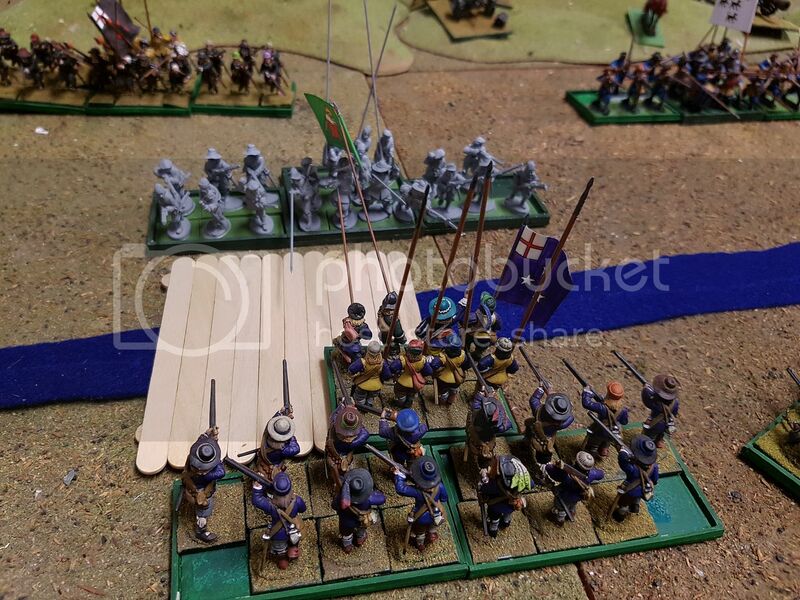 Newcastle's regiment is also shot up, but not as badly, but does make the New Model infantry as they are charged by Cromwell's horse as they pursue another foot regiment which had broken in panic at the approach of the New Model cavalry. The Lancers finally get rid of the Lobsters. But they are isolated and the Raw horse in front of them now charge and rout them. Oh for the Prince. The recovering Irish are charged and broken. Newcastle's men are giving ground. The Ironsides are driving back their opposites numbers. The Right wing has collapsed and the 2 foot regiments trying to pass between the Parlimentary left and centre are met by the only reserve, a regiment of New Model foot and a light gun. The craicks terrible here Paddy! At this point the King conceded and began to withdraw his army. I certainly had fun and I believe that everyone enjoyed the night. We will see if there are more such games in the future (particularly when I have caught up on all my painting. Re: God Save the Prince! I am counting 4 people made it that night. Not a bad turn up indeed on a cold winters night. How did the others like the rules having been their first use of them..[maybe Tyberius had played them before at the club?..and pointing out those not knowing these rules that the Wes who played was not Wes the writer of the rules so he would have been new to the rules too..] If I still lived in Sydney I would have been there old boy. Looks a great bash. The recovering Irish are charged and broken. If they failed in the end, well I have forgotten that. I think that they liked the rules. Relatively simple they are give a good result but one does need to keep checking a units morale. Ty was very surprised at how little manuever is possible with troops of this period. Mick was talking about some ACW rules and Ty wants to do 30 Years War battles. Stay tuned. yes when we first started using the rules in the club I was reluctant because they were a take on the WRG rules [which I really dont care for] but the writer cleaned it up enough that I came to accept them , then like them enough not to want to learn new ones for club use. Ty probably too used to his roaming ancient unts...hee hee..Be good to see Ty's 30 years war army on the table. 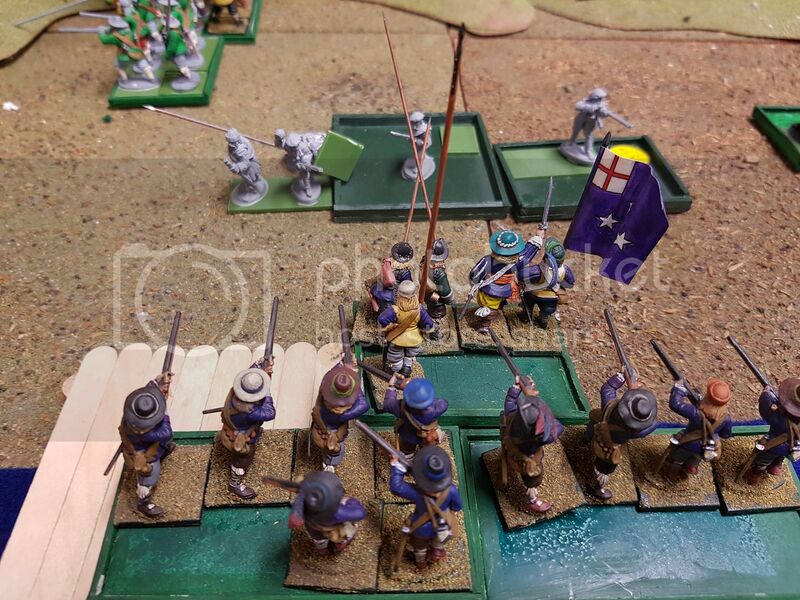 Ah I bought a set of ACW rules off Mick from his table at MOAb years ago, perhaps they are his rules of interest..i think they were called "Civil War Battles" Rules by RFCM at Peter Pig. Hey Easy this is not a period of warfare that has interested me gaming wise (the actual history is interesting though!) looks like a good game was had. 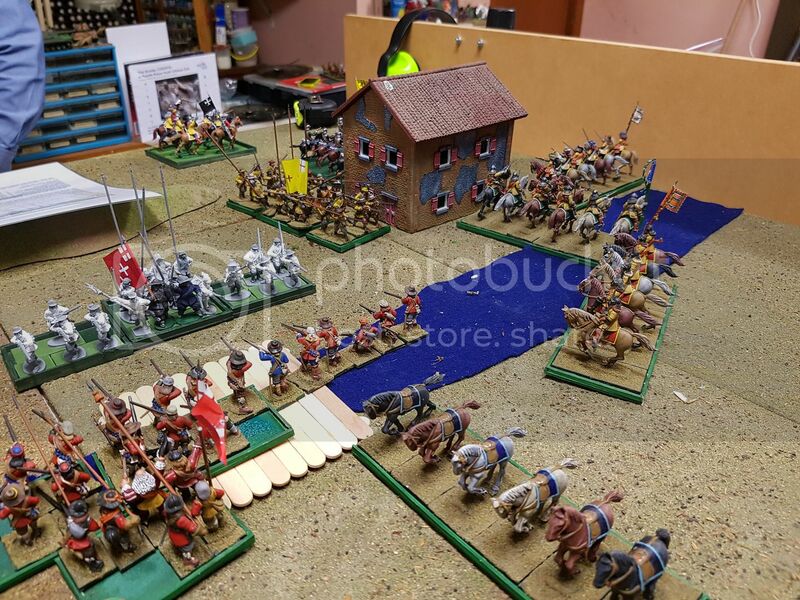 I look forward to seeing all the figures and terrain finished it will be spectacular!